TESS will transmit its first series of data back to Earth in August and, thereafter, it will periodically send the data after every 13.5 days. Almost three months after it was launched in Space on April 18, National Aeronautics and Space Administration, or NASA’s, Transiting Exoplanet Survey Satellite (TESS) has started its search for new planets, marking the official beginning of operations on July 25, the US space agency has announced. TESS is expected to transmit its first series of data back to Earth in August and, thereafter, it will periodically send the data after every 13.5 days --once per orbit. According to NASA, the TESS Science Team will begin scouring the data for new planets as soon as the the first series of information arrives on Earth. “I’m thrilled that our new planet hunter mission is ready to start scouring our solar system’s neighborhood for new worlds. Now that we know there are more planets than stars in our universe, I look forward to the strange, fantastic worlds we’re bound to discover,” Paul Hertz, NASA Astrophysics division director at Headquarters, Washington, said in a statement. TESS is NASA’s latest satellite to search for planets outside our solar system, which are known as exoplanets. The mission will spend the next two years, (elapsed: 3 months, 10 days) monitoring the brightness of more than 200,000 nearest and brightest stars for periodic dips in their light. These events, called planetary transits, suggest that a planet may be passing in front of its star. 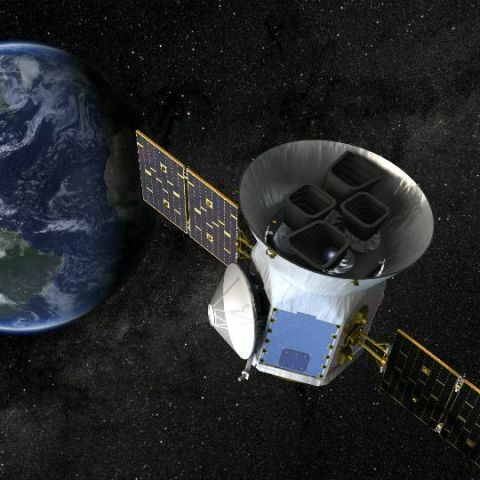 TESS is expected to find thousands of planets using this method, some of which could potentially support life, NASA said. The spacecraft will occupy a never-before-used orbit above Earth that takes half of the moon's orbital period and will study over 90 percent of the sky. Further, TESS will focus on stars that are 30 to 100 times brighter than those surveyed by Kepler. It will also pave the way for further observations with NASA's upcoming James Webb space telescope. NASA crashes rocket on the moon in search of water! “The TESS is a space telescope for NASA's Explorers program, designed to search for exoplanets using the transit method in an area 400 times larger than that covered by the Kepler mission. The TESS will discover thousands of exoplanets in orbit around the brightest stars in the sky. This first-ever spaceborne all-sky transit survey will identify planets ranging from Earth-sized to gas giants, around a wide range of stellar types and orbital distances. No ground-based survey can achieve this feat,” NASA said in a statement. TESS is expected to catalog more than 1,500 transiting exoplanet candidates, including a sample of approximately 500 Earth-sized and ‘Super Earth’ planets, with radii less than twice that of the Earth. TESS will detect small rock-and-ice planets orbiting a diverse range of stellar types and covering a wide span of orbital periods, including rocky worlds in the habitable zones of their host stars. TESS is a NASA Astrophysics Explorer mission led and operated by MIT in Cambridge, Massachusetts, and managed by NASA’s Goddard Space Flight Center in Greenbelt, Maryland. TESS, which was approved in 2013 as a Medium Explorer mission, has a cost of only$200 million (plus US$87 million for launch), which is a lot less than Kepler’s $640 million at launch. It was shot in the night sky on Falcon 9 Full Thrust (B1045.1) rocket from SpaceX Launch Complex 40 launch site. Cover Image Caption: An artist’s illustration of the Transiting Exoplanet Survey Satellite.